Your college dorm room decor is about making your college dorm room a comfortable, cool place to hang out. It is also about expressing your interests and personality. One of the best ways to display your interests and personality is through your college wall decor. Your college wall decor will let you place photographs and college posters of your favorite things right on your dorm room wall so you get to look at what you love every day in college! What better way to add to your dorm room decor than with your favorite band! Our AFI - Crash Love - College Dorm Poster features a photo of the band members. This dorm essentials item has the band dressed mostly in black with their clothes fading into the black border along the bottom. This college supplies dorm product has a simple design, but it looks super cool. AFI is leaning against a silver backdrop, adding neutral tones to your dorm room decorations. 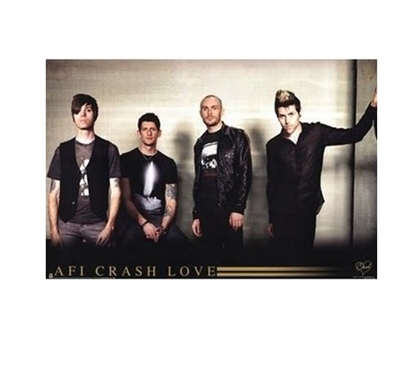 AFI fans can't go wrong with this dorm necessities item in their dorm wall art!